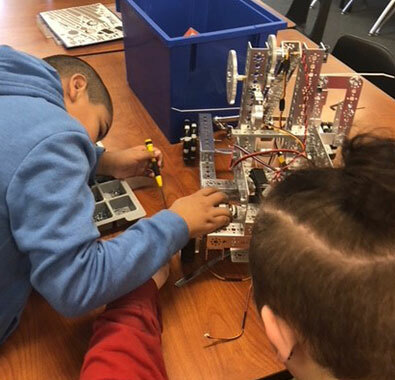 Boys and Girls Haven, a residential school in Louisville, Kentucky, received a 2017-2018 FIRST® STEM Equity Community Innovation Grant to open STEM pathways to its students through the creation of a FIRST® Tech Challenge program. Boys and Girls Haven serves many of Kentucky’s most vulnerable young people. The young people who arrive on our Louisville campus have been removed from their families. They’ve often faced disruptive, chaotic living environments and many have had multiple placements. Boys and Girls Haven shelters, heals, and teaches struggling young people so that they can become productive, healthy members of our community. Our FIRST STEM Equity Community Innovation Grant supported that mission by enabling us to create a stimulating, enriching environment for learning academic and life skills. With the grant funds, we formed and registered two FIRST Tech Challenge teams, one made up of young people attending our campus school and the other comprised of kids who attend local public schools but live at Boys and Girls Haven. The program included career exploration outings to GE and Toyota and a visit to the Kentucky Science Center. In addition, both teams attended two robotics events. Learn strategies Boys and Girls Haven and other high-poverty schools are using to bring hands-on STEM programs into their classrooms.